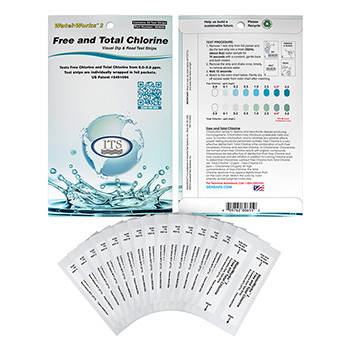 Water test strips to check your water for Free and Total Chlorine. Contains 30 test strips. Fast, accurate, visual results. W do-it-yourself quick test strip with 2 indicators to detect Free and Total Chlorine (chloramines). This test is a great way to determine if your water company uses chlorine or chloramines for water treatment. This is ideal for many applications: to test your home water, school projects, food processing environment, and places where you may need to check if you have a correct amount of sanitizer present in water. Packet of 30 strips, no external chemicals are needed to perform water tests. You can test 30 times, or up to 30 different water sources. Tests can be used under various water temperature. First EPA approved Free Chlorine indicator on the market! 1. Dip one test strip into a 250 ml (1 cup, about 8 oz.) sample for ten (10) seconds, with constant back and forth motion that maximizes water flow through an indicator pad. 2. Remove and shake strip once, to remove excess water. Wait for fifteen (15) seconds. 3. Match the best color for Free Chlorine (end pad) , and Total Chlorine (pad closest to handle) to determine Parts Per Million (ppm) or mg/Liter concentration of chlorine and chloramines in your water sample. If you find that your level of chlorine is 4.0 ppm (parts per million) or above, please dilute water sample (mix half tap water and half distilled water) and repeat a test, until you get a number in the range between 0.1 and 2.5. Then multiply your number by the number of times you had to dilute water. Chloramine, which is also called "combined chlorine", is a chlorine combined with another chemical. Free Chlorine test will not show levels of combined chlorine (chloramines) in your drinking water. That's why we provide a dual test for Free and Total Chlorine. US Patents 5491094 and 6541269. This test outperforms older OTO (Orthotolidine) chlorine tests that use drops. Product uses ITS method D99-003 (revision 3, Nov.21 2003) in EPA format. For compliance purposes this test must be used in format above. My husband thought I was crazy when I told him I refuse to drink your tap water. He couldn’t tell but to me it was obvious there was some kind of unpleasant taste I couldn’t stomach. After using the free and total Chlorine test, I proved to him that we have a high chlorine level. Great product! We later bought a filter pitcher from these guys (that we both love!) and I can now drink our tap water without complaint.